Two new tunes by Washington, D.C. all-star garage rock crew, Des Demonas. Features members of Hammered Hulls, Foul Swoops, and Kid Congo Powers & the Pink Monkey Birds. A-side "Bay of Pigs" is an organ drenched derge that evokes The Fall or, maybe, a Jonathan Fire*Eater deep cut. At any rate, it's an excellent addendum to the band's debut LP, which arrived last year via In the Red Records. Four songs by late 80s Northern Virginia/DC punk quartet, Indian Summer. While these songs were put to tape in 1989 by J Robbins, this is the first time they have been available on vinyl with an additional demo. Though short-lived, the band was a regular in the local all-ages scene in 1988 and 1989, playing Merrifield Community Hall, Arlington Women’s Hall and many a punk house party, a Positive Force show at d.c. space, and some of the first all-ages matinees at the Safari Club. Members would go on to join Chisel, Pelt, and Edsel. A reissue of The Mercury Program’s much-loved double LP, A Data Learn the Language. First released in 2002, the record went quickly out of print on vinyl and has remained extremely hard to find. Now reissued by Lovitt Records, this version has been recut by Bob Weston at Chicago Mastering Service and pressed on 180 gram black vinyl with a gatefold sleeve. Warm, melodic, minimalist instrumental music with a dialed-in rhythm section. A companion to filmmaker Scott Crawford's DC punk documentary, Salad Days, gathering music from the film as well as era-appropriate works by Marginal Man, Government Issue, Black Market Baby, Jawbox, United Mutation, Holy Rollers, Swiz, Fire Party, and Kingface. The debut full-length by Washington, D.C. punk/power pop quartet, Bad Moves. The album features 12 tuneful, personal, and politically conscious songs recorded in Philadelphia last year with Hop Along's Joe Reinhart. Features David Combs (Max Levine, Spoonboy, Somnia) as well as Emma Cleveland, Katie Park (Hemlines), and Daoud Tyler-Ameen. Recommended! Hypnotic bass and percussion compositions from Washington, D.C.'s Luke Stewart (Low Ways Quartet, Irreversible Entanglements) and Warren G. Crudup III. Long-form improvisations that are alternately serene and heavy, heady and visceral. Out via Atlantic Rhythms, who have also released tapes by Arto Lindsay and Curved Light. The seventh full-length studio album by Los Angeles-based/D.C.-bred psych-rock trio, Dead Meadow. Released on the eve of the band's 20th anniversary, the record includes performances by a number of Dead Meadow alumni, including guitarist Cory Shane and drummers Mark Laughlin and Stephen McCarty. Recommended. The debut record by Washington, D.C./Carrboro, NC duo Bat Fangs, who are Betsy Wright (Ex Hex) and Laura King (Flesh Wounds). High energy 80's riff-rock distressed using lo-fi psych and garage moves. New music from former Soulside/Girls Against Boys members, Scott McCloud and Alexis Fleisig. A familiar sense of melody/rhythm presented via a slightly more subdued setup, often driven by acoustic guitar and drums. The debut album by Houston, TX trio Cool Moon. A record of loud and heartfelt rockers from former D.C. resident and Del Cielo (Lovitt Records) member Andrea Lisi. You can read a short interview with the band and preview a track here. The definitive primer/history lesson on Ian Svenonius' "Crime Rock" band, courtesy of In the Red Records. This album features recent re-recordings of Chain "hits" like "Devitalize," "Certain Kinds of Trash," and "Mum's The Word" recorded by the group's latest and greatest lineup. A reissue of Bikini Kill's three-song New Radio single. Originally released in 1993, the 7" was produced by Joan Jett at Avast Studios in Seattle, WA and includes one of the more beloved versions of the BK classic, "Rebel Girl." Two new songs by Washington, D.C. trio Flasher. A forward move from their previous EP in terms of arrangement and home studio know-how. A-side is quick and catchy while the flip goes long and woozy. A new song and a remix by Washington, D.C. trio Puff Pieces (ex-Antelope). The A-side was recorded by Ian MacKaye and Don Zientara at Inner Ear Studios. The sixth and final album by the mellow Washington, D.C.-based funk/post-rock outfit, The Sorts. Formed in 1994, the band was anchored by guitarist Josh LaRue (HiM), drummer Chris Farrall (Hoover), and bassist Stuart Fletcher. Originally released only on CD in 2003, Bcore has now given the record its first-ever vinyl pressing. Guitarist Alex Dunham's post-Hoover trio with Arief Sless-Kitain and Cret Wilson. Mercury was first released as a four song 12" EP in 1996 and then later expanded into a full-length CD that compiled a number of the band's singles and rarities. It's now on LP for the first time courtesy of Bcore. The debut album by Washington, D.C. dance/pop outfit, Coup Sauvage & the Snips. Weirdo house-party music with electronic rhythms and call and response vocals. Features Jason Barnett of Gauche and Hott Beat. The solo debut by Priests singer and Sister Polygon Records co-proprietor, Katie Alice Greer. Lo-fi electronics and samples conjure suburban isolation and alienation. Give it a listen online or buy digitally here. The third full-length by Washington, D.C.-based power-pop outfit, Title Tracks. 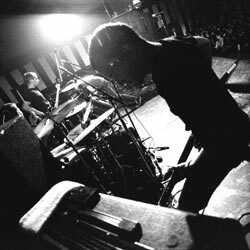 Founded in 2008 by John Davis (Q and Not U), the band has released two full-length records on Ernest Jennings as well as a two song single on Dischord. At present, the band is a trio featuring Davis as well as bassist Michael Cotterman (Loved Ones) and drummer Elmer Sharp. You can preview the record online here. Originally released on cassette earlier this year, Sister Polygon has now reissued Flasher’s seven song debut EP on vinyl. Formed in 2015, Flasher is Taylor Mulitz (Priests), Daniel Saperstein (Bless), and Emma Baker (Big Hush). Excellent minimalist post-punk that channels Wire as well as Teenbeat heavies like Unrest. Recommended. Beauty Pill’s second full-length album, released in 2015 by Butterscotch Records. Years in the making, Describes Things As They Are finds songwriter Chad Clark augmenting his arrangements with electronic rhythms, horn arrangements, and noise. This pressing is on translucent red vinyl. We carry the entire catalog of in-print Dischord CDs, LPs, DVDs and MP3s. We also sell hundreds of releases from bands and labels from the Washington, DC underground community. The featured sections list just a sample of the inventory we carry. Use the search tools and direct links to view much more of the music that we have available. Con Art 20th Anniversary Edition Ernest Jenning Record Co.